It has become commonplace these days to speak of "unpacking" texts. Voice and Vision is a book about packing that prose in the first place. While history is scholarship, it is also art-that is, literature. And while it has no need to emulate fiction, slump into memoir, or become self-referential text, its composition does need to be conscious and informed. 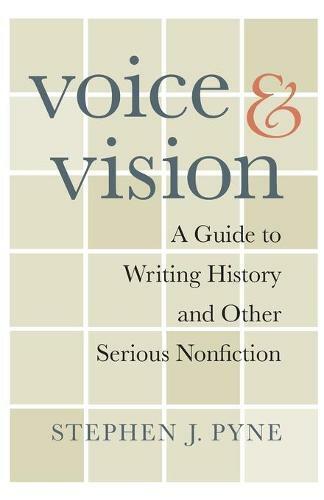 Voice and Vision is for those who wish to understand the ways in which literary considerations can enhance nonfiction writing. At issue is not whether writing is scholarly or popular, narrative or analytical, but whether it is good. Fiction has guidebooks galore; journalism has shelves stocked with manuals; certain hybrids such as creative nonfiction and the new journalism have evolved standards, esthetics, and justifications for how to transfer the dominant modes of fiction to topics in nonfiction. But history and other serious or scholarly nonfiction have nothing comparable. Now this curious omission is addressed by Stephen Pyne as he analyzes and teaches the craft that undergirds whole realms of nonfiction and book-based academic disciplines. With eminent good sense concerning the unique problems posed by research-based writing and with a wealth of examples from accomplished writers, Pyne, an experienced and skilled writer himself, explores the many ways to understand what makes good nonfiction, and explains how to achieve it. His counsel and guidance will be invaluable to experts as well as novices in the art of writing serious and scholarly nonfiction.